These computational studies examine transient, reactive compressible flow phenomena associated with advanced rocket and airbreathing propulsion systems. These studies, conducted in collaboration with Drs. Jean-Luc Cambier of AFOSR and Venke Sankaran of AFRL, involve the simulation of pulsating detonation phenomena, the influence of magnetohydrodynamic (MHD) forces on detonations, collisional-radiative kinetics and other non-equilibrium processes in partially ionized plasmas, and kinetic energy-preserving discretization schemes for turbulent reactive flows. In many cases, simulations involving complex kinetics are conducted on our group�s 8-node HP Nvidia M2070 (6 GB) Tesla GPU cluster. A Stabilized Scale-Similarity Model Formulation for Large-Eddy Simulations, Edoh, A. and Karagozian, A. R., accepted for the 55th AIAA Aerospace Sciences Meeting/Science and Technology Forum and Exposition, Grapevine, Texas, January, 2017. Efficient Filtering Formulations for Large-Eddy Simulation, Edoh, A., Mundis, N. L., Karagozian, A. R., and Sankaran, V., Paper AIAA-2016-3794, 46th AIAA Fluid Dynamics Conference, AIAA Aviation and Aeronautics Forum and Exposition, June 2016. The Role of Dispersion and Dissipation on Stabilization Strategies for Time-Accurate Simulations, Edoh, A., Mundis, N. L., Karagozian, A. R., and Sankaran, V., Paper AIAA-2016-0071, 54th AIAA Aerospace Sciences Meeting/Science and Technology Forum and Exposition, San Diego, CA, January, 2016. GPU-based flow simulation with detailed chemical kinetics, H.P. Le, J.-L. Cambier, L.K. Cole, Computer Physics Communications, 184, pp. 596-606, 2013. Comparison of Artificial Dissipation and Filtering Schemes for Time-Accurate Simulations, Edoh, A., Karagozian, A. R., Sankaran, V., and Merkle, C., Paper AIAA-2015-0284, 53rd AIAA Aerospace Sciences Meeting/Science and Technology Forum and Exposition, Kissimee, Florida, January, 2015. Complexity Reduction of Collisional-Radiative Kinetics for Atomic Plasma, H. Le, A. R. Karagozian, J.-L. Cambier, Physics of Plasmas, Vol. 20, No. 12, 123304, 2013. Stability of Flame-Shock Coupling in Detonation Waves: 1D Dynamics, Cole, L. K., Karagozian, A. R., and Cambier, J.-L., Combustion Science and Technology, Vol. 184, Issue 10-11, pp. 1502-1525, 2012. Magnetohydrodynamic Augmentation of Pulse Detonation Rocket Engines, Zeineh, C. F., Cole, L. K., Roth, T., Karagozian, A. R., and Cambier, J.-L., Journal of Propulsion and Power, Vol. 28, No. 1, pp. 146-159, 2012. Stability of Flame-Shock Coupling in Detonation Waves: 1D Dynamics, Cole, L. K., Karagozian, A. R., and Cambier, J.-L., Paper 89, 23rd International Colloquium on the Dynamics of Explosions and Reactive Systems (ICDERS), UC Irvine, July 24-29, 2011. The Pulse Detonation Rocket Induced MHD Ejector (PDRIME) Concept, Cambier, J.-L., Roth, T., Zeineh, C., and Karagozian, A. R., 44th AIAA/ASME/SAE/ASEE Joint Propulsion Conference and Exhibit, Paper AIAA-2008-4688, July, 2008. Pulse Detonation Engine Simulations with Alternative Geometries and Reaction Kinetics, He, X. and Karagozian, A. R., Journal of Propulsion and Power, Vol. 22, No. 4, pp. 852-861, 2006. Performance and Noise Characteristics of Pulse Detonation Engines, AIAA Paper AIAA-2004-0469, 42nd AIAA Aerospace Sciences Meeting, January, 2004. Numerical Simulation of Pulse Detonation Engine Phenomena, He, X. and Karagozian, A. R., Journal of Scientific Computing, Vol. 19, Nos. 1-3, pp.201-224, December, 2003. Detonation Engine Simulations with Alternative Reaction Kinetics and Geometrical Features, He, X. and Karagozian, A. R., Paper 03F-70, Western States Section/The Combustion Institute Fall Meeting, UCLA, October, 2003. Numerical Simulation of Pulse Detonation Engine Reactive Flow Processes, He, X. and Karagozian, A.R., Paper No. C-29, 3rd Joint Meeting of the U.S. Section of the Combustion Institute, March, 2003. Reactive Flow Phenomena in Pulse Detonation Engines, He, X. and Karagozian, A. R., Paper no. AIAA-2003-1171, 41st AIAA Aerospace Sciences Meeting, January, 2003. 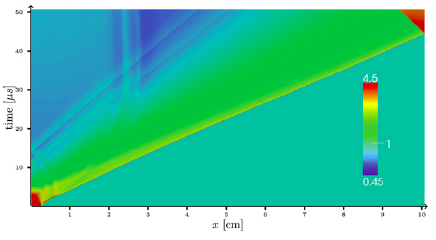 Numerical Resolution of Pulsating Detonation Waves, Hwang, P., Fedkiw, R. P., Merriman, B., Aslam, T. D., Karagozian, A. R., and Osher, S. J., Combustion Theory and Modelling, Vol. 4, No. 3, pp. 217-240, September, 2000.